Stevie has a lot of dreams … more friends at school, better drawing pencils and a pony. If only she had her dream horse, her life would be better and the other horse-mad girls would talk to her. When her brother is taken to hospital, Stevie’s dreams seem further away than ever. Suddenly her after-school world is filled with hospital visits and there’s even less money for anything, especially a pony. With Stevie’s mum spending more time with her brother, Stevie has to learn to figure out the hard things in life by herself. A gem of a book. Stevie could be the edgy younger sister of Catherine from the author’s YA novel Loving Richard Feynman. Stay Well Soon is SUCH a great book! One reason I like it so much is that everything isn’t just sunshine and rainbows – like real life. This is a book which will stay with you long after the final word is read. 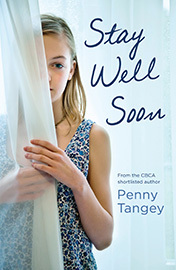 Stay Well Soon is a touching story of a young girl learning more about life. A story of acceptance of death and dying, humour abounds in the relationships Stevie has with her peers. This is a wholly satisfying novel about cancer and its effects on one young girl. A touching story of growth and coming-of-age for children aged 9 and above. I admit to shedding a few tears. This is a moving tale of reality, sadness and loss, told with several sub-stories that keep the pages turning. Penny Tangey has convincingly captured the dilemmas and angst of childhood; its patterns and progress. Stevie’s voice felt very real and I warmed to her honesty. The novel is written as though it was for a primary school child, and although the plot touches on death and its ramifications, the subject is handled with sensitivity and reassurance.